Josh Dowdy, 24, crouching in the middle of a West Foster Creek side channel, measuring pebbles. U.S. District Court Judge James Redden is behind the push for a fine-grain accounting of Columbia Basin fish habitat. He's expected to decide any day now whether to approve the federal government's latest "biological opinion" for operating hydropower dams through 2018 while protecting salmon and steelhead listed under the Endangered Species Act. The plan relies heavily on more habitat investment to increase salmon survival -- as opposed to, say, knocking down dams. The judge wants survival estimates -- detailed by tributary for 77 fish populations -- to be independent, reliable and "scientifically verifiable." 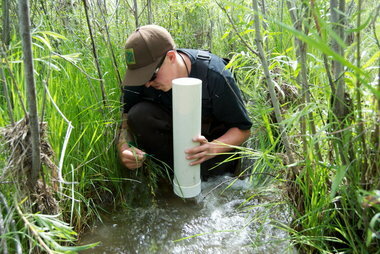 Measuring the Salmon Data in the Streams of the Columbia River Basin <-- Full story available at original site.